The present organ in the St. Servaas Basilica has had an eventful history. Its origins date back to the early 1650s in the nearby church of the Dominicans (Dominicanenkerk). At that time, this church had a 19-stop three-manual organ in the Southern Dutch and Flemish style. In 1734, the organ was altered by Jean-Baptiste Le Picard. This Liège-born organ builder gave the instrument a more Wallonian character. This large instrument had 14 stops on the Grand Orgue, 8 stops on the Positif and 6 on the Echo. In accordance with southern tradition, the Echo was a half (treble) manual. Due to the upheaval caused by the French Revolution, the organ in St. Servaas was lost, together with most of the articles and fittings in the church. To this day there are no exact details on what type of instrument it was, but to judge by records it is clear that it must have been a rather large organ. When the church was reopened for worship in the 19th century after the Napoleonic period, the St. Servaas authorities purchased the organ from the church of the Dominicans. Between 1804 and 1806, the newly acquired instrument was relocated to St. Servaas by the Maastricht organ builder Joseph Binvignat. Binvignat had already been responsible for maintaining the organ in the church of the Dominicans. He probably added just one stop (Viola di Gamba 8) and introduced no further changes. In 1839 and 1841, his son Adam made various alterations. In 1843, the stone structure on which the organ stood was demolished, so that the organ had to be dismantled and relocated to the west end of the church. This work was carried out by the Franssen brothers from Horst. In effect, a new organ was built using parts of the front and a major part of the pipework. The Grand Orgue pipework was placed left and right in the case, with the Positif and Echo pipework in the middle. The pedal was given its own stops for the first time, but as there were no 16 foot stops, the pitch was that of a tenor rather than a bass. The action and windchests were constructed in a somewhat primitive manner. The instrument was constructed within one large case, and the form that the organ now has was largely determined by this process of reconstruction and relocation. Between 1852 and 1855, the organ was constantly altered and extended by the organ builders Pereboom and Leijser. Stops were added, some of which were placed in a small new casing: the Récit, Positif and Echo were placed in a swell box. The pedal was changed considerably, as many of Franssen’s stops were replaced by 16 and 8 foot pipework. In 1882 two new stops and a tremulant were added by the same organ builders. The last work on the instrument prior to the most recent reconstruction took place in 1912 and 1913. A new Pereboom generation replaced the old bellows by a huge horizontal reservoir which is still in use today. Furthermore, the number of stops was reduced on both Positif and Echo, the Récit disappeared altogether, so that the second and third manuals became a pale shadow of what they were during the early and mid-19th century. As time went by, the organ deteriorated further. Eventually, Hub Wolfs, the organist at that time, could only improvise on the stops which were still working; playing organ literature was extremely difficult. Due to the poor condition and the fact that important parts were inaccessible, it was no longer possible to tune the organ or carry out any kind of repairs. Despite all these flaws, the interesting and valuable nature of the organ was still apparent. A total reconstruction turned out to be the only real solution. An important impetus in this respect was the restoration of the church, of which the organ was an integral part. After serious consideration, Hans van der Harst, Onno B. Wiersma (national organ advisor), the church architects, the organist Hub Wolfs and the firm of Verschueren in Heythuysen cam to a definitive decision on how to approach the reconstruction. The diversity of styles with material from 17th to 20th century presented a thorny problem. It was decided to base the reconstruction on 19th century Southern Dutch and Wallonian organ styles. In 1989, the restoration work– which would take three years – was begun. The Verschueren Organ Construction company remodelled the organ with a splendid stylistic unity while preserving as many of the old parts as possible. It was possible to save the pipework and the windchests, in particular, renovate them. The poor condition of the action and swell box made a total revision necessary. Sections of the case were redesigned using old parts as the restoration of the church made these alterations necessary. The keyboard was relocated from the side to the front of the organ. In 2012 Verschueren Organ Construction company undertook a thorough cleaning of the organ. For architectonic reasons the original St. Servaas choir organ, which was built in 1981, could not be maintained after the church restoration, because of architectural considerations. To solve this problem, Verschueren Organ Construction company built a smaller organ, with only one manual, that was positioned in the neo-Gothic choir in the church. The late 17th century pipework of the Lutheran church organ (in Maastricht) was chosen as a starting point for the building of the new choir organ. In the Positif of this organ (built in 1695 by Hendrick Metzeler) the Bourdon 8′, Fluit 4′, Nasard 3′ and Doublette 2′ complement each other perfectly. In the choir organ a Prestant 4′ and a Fluit Travers 8′ Disc, which is built according to 17th century construction methods, have been added to these stops. However, this overblowing flute with its double length is not provided with a hole in the body. Construction: (probably) by Pieter Künckel. This organ was set up in the day chapel in the St. Servaas basilica. 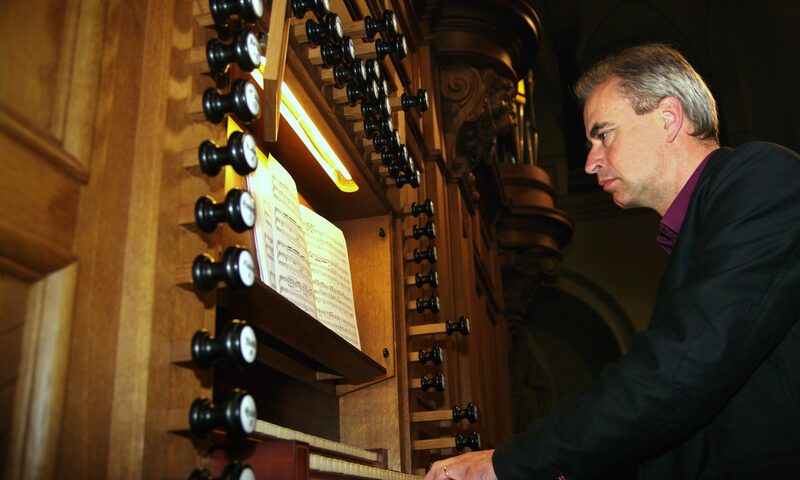 In 2013 the instrument was completely restored by the organ builder Hans van Rossum.